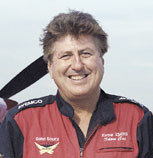 Gene Soucy is one of the most well-respected and proficient airshow pilots in American aviation. He is a former member of the record-setting Eagles Aerobatic Flight Team, he has been a member of two World Champion U.S. Aerobatic Teams, and he has won more awards than any other active airshow pilot. Innovation and versatility are Gene Soucy’s style. It is no wonder as to why he has rightfully been nicknamed “Mr. Airshow.” At the age of twenty-two, Gene earned a position on the U.S. Aerobatic Team, making him the youngest competitor flying at the World Contest in England held that year. He finished strongly in his Pitts Special and placed 6th overall, which helped the U.S. Team to win its first World Championship. Since that very auspicious beginning, Gene has gone on to gather an impressive competition record. He became a three-time U.S. National Champion and a three-time Canadian National Champion, and he has been an active pilot in the unlimited category since 1969. Gene began professional airshow flying in 1968, and since then he has appeared in every major airshow in North America. He has also stunned and entertained audiences with his exciting performances on four continents. His 3000+ airshow performances have seen versatility with the wide range of airplanes he has flown in. Gene began his career with appearances in his first airplane, the Pitts Special S-1S. He branched out to include demos in the BD-4 homebuilt and Bellanca Decathlon. He even razzled and dazzled with thrilling comedy routines in Piper Cubs and Cessna 150s. Perhaps his most outstanding performances came with his involvement on both the Red Devil and Eagle Aerobatic Teams, which he flew for an unprecedented twenty-five years! In 1988, Gene looked to be unique once again and began developing a new airshow airplane for his performances. What he came up with was the “Showcat.” By extensively modifying a Grumman Ag Cat, a bi-plane traditionally used for crop spraying, Gene emerged with a tremendous airplane built for the rigors of a wingwalking act and a “Fireflight” night performance, not to mention the most unbelievable solo act of smoke and noise ever to reach the skies. In addition to the Showcat, Gene’s other mount for the past ten years has been the Extra 300S monoplane. His precision and high-energy championship solos in his Extra 300S deliver thrill upon thrill to audiences world-wide with gyroscopic tumbling and a heart stopping Inverted Ribbon Cut. Gene’s career does not stop merely at airshows. He has also worked as a stunt pilot on major motion pictures and television movies as a member of the Screen Actors Guild. Some of his projects include Aces/Iron Eagles III with Louis Gossett, Jr., and The Pancho Barnes Story starring Valerie Bertinelli. Furthermore, he and wingwalker Teresa Stokes have been featured on the Discovery Channel’s World of Wonder, Real TV, Good Morning America, ESPN, and National Geographic Today. Even more than that, Gene is a captain for Northwest Airlines when he is not performing at airshows. Gene Soucy is a wonder in the sky and one of the most remarkable aerobatic pilots ever to have lived. In addition to his numerous competition achievements, Gene has won many individual titles throughout his career. In 1997, he received the Bill Barber Award for Showmanship, as well as the Rolly Cole Memorial Award. In 1998, Gene was presented with the prestigious ICAS Sword of Excellence for his service to the airshow industry. Gene is also a past recipient for the Clifford L. Henderson Achievement Award. Whether Gene is performing in his Extra 300S, flying his wingwalking act with Teresa Stokes, performing a spectacular night aerial pyrotechnic display in the Showcat, flying jets, or setting records with his formation aerobatic flying, there is no doubt that he can do it all. And Gene Soucy definitely has done it all!